Some say boyfriends look ugly. That's not true. All depends on the way how you can style them. 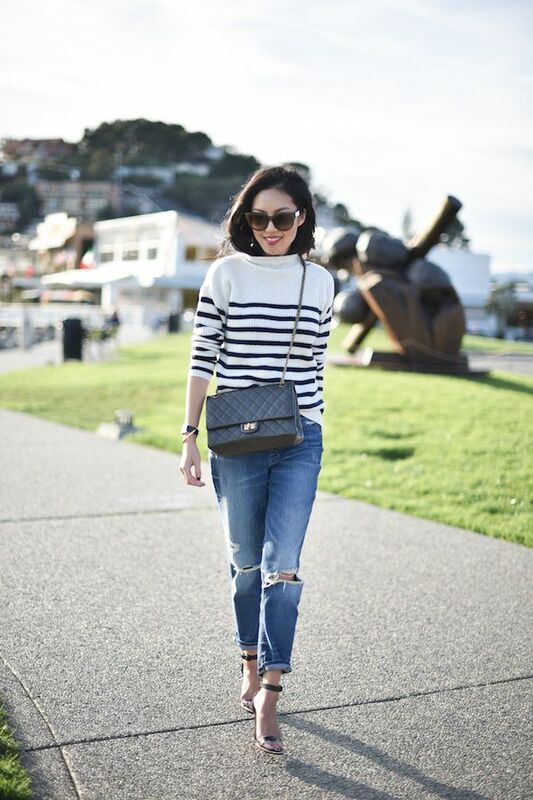 Today I want you to have a look through 10 best ways to wear boyfriend jeans in your everyday life. One thing is for sure, you either love them, or hate them. Personally, I was skeptical about these styles for about one year, then I gave them a try, and you know what? I really liked them. Why? They are extremely comfortable and ideal for wearing with casual and semi-formal wear. They are great for everyday street wear and country side trips. The real paradox is the sloppy and unpleasant, but once you complete the look by adding cool black blazer or slim-fit leather jacket, you automatically achieve a kind of super glamour touch, what makes you look like a real fashionista. Go for a loose-fit floral shirt and style it with cuffed light blue boyfriends. 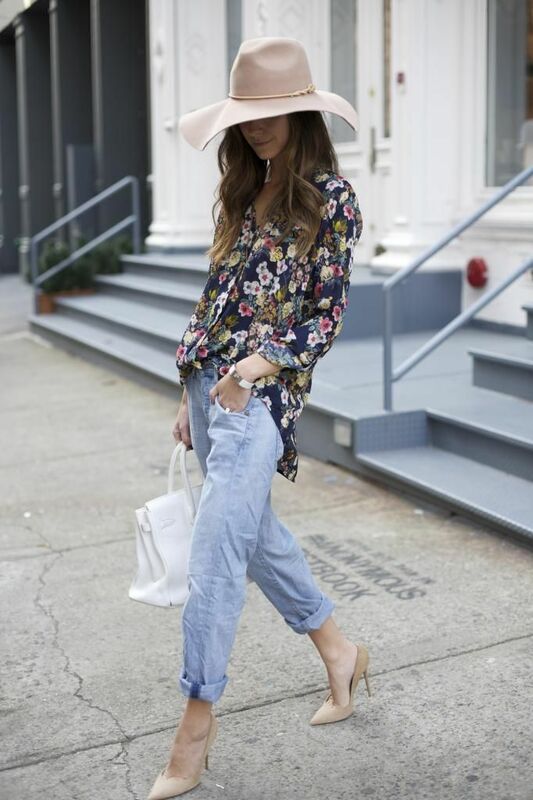 Complete the look by adding light beige pumps, white handbag and wide-brim floppy hat. A pair of boyfriends can be your best friend or worst enemy. So you better know the basic rules of wearing them with your daily outfits, so you make them work for you. They undoubtedly look awesome with other denim pieces, in other words double denim is always on trend. It's a great way how you can make these loose-fit and wide bottoms work for you. For instance, you can wear them with chambray shirt for a relaxed and casual look, or you can keep things smart-casual by styling boyfriends with white shirt and denim jacket for a classic summer look. Wear them cuffed. This is a perfect update, I would even say a kind of styling trick that gives your outfit a more rugged and undone look. Boyfriends and heels? Serious? Why not! This combination will add a polished touch to your outfit. If you want to add heels, then you better keep top tailored and polished. You can add silk blouse, pearl necklace and leather heels. 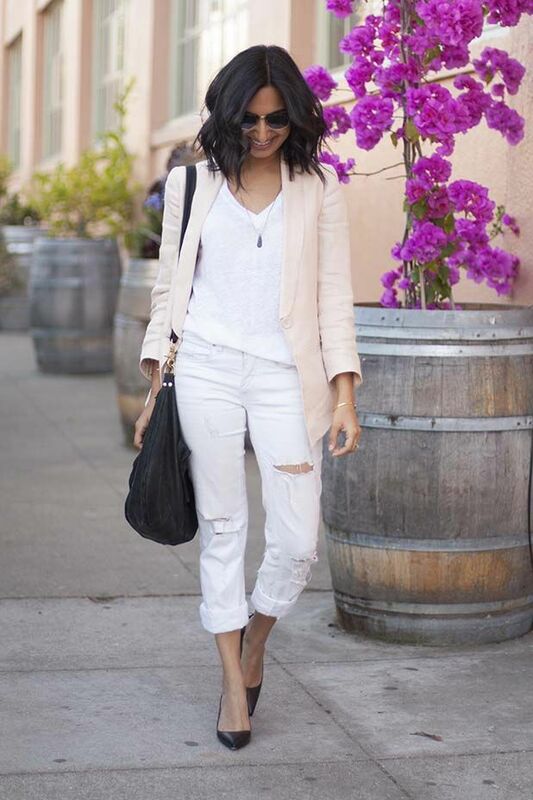 The regular blue colored boyfriend jeans look awesome with dressy top, like white shirt. You can always go to the basics by pairing denim bottoms with your everyday closet staples, like plain button-downs or cool blazers.